we are looking for is Android, usually one of the first few for everyone. 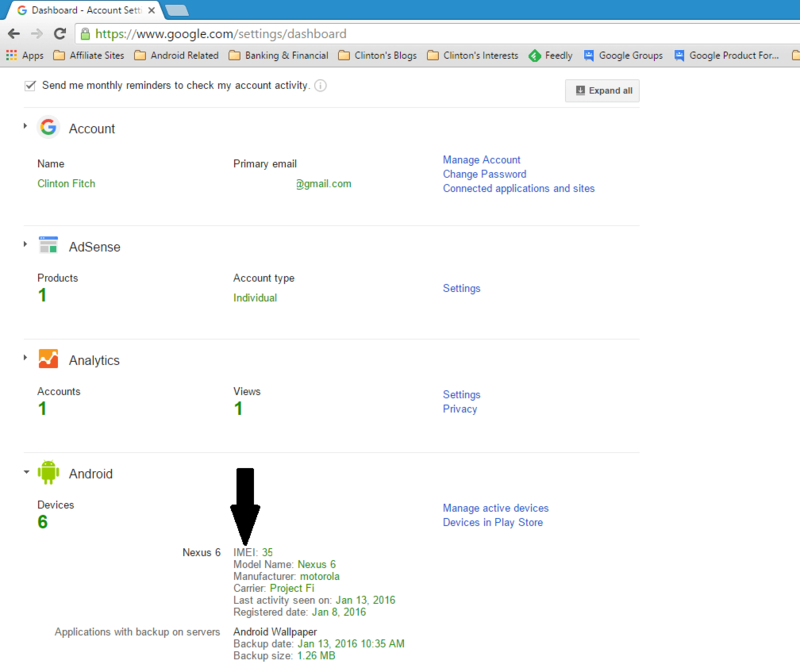 You’ll notice that there is a large green number that indicates the number of devices you have associated (or have in the past) with your account. Use the carrot to expand the Android section and there you will see all your Android devices and related information like backups. Scroll through the Android section until you find your dead device and the first line you will see for that device is your IMEI number. Ta-da! Now you can fill out that claim form quickly and easily. Now this isn’t the only way to get the IMEI number for your device. Some devices have the number imprinted on the SIM tray while others have it under or by the battery (if it is removable). The Dashboard however, so long as you have associated it with your Google account, will have the number so it is pretty much a lock. Finally, a word of warning. Never post your IMEI number publicly. Consider it confidential information (you’ll note I blanked mine out in the screenshot). There are apps that will spoof IMEI numbers which can lead to erroneous charges or your number could be used for illegal activities.